How many times have you wished you had eyes in the back of your head? Not just to watch your kids, but to help you see when you are backing out of your driveway. Being aware of your surroundings, wherever you are and whatever you’re doing, just makes good sense, especially when you’re behind the wheel! For example, backing out of your driveway. Before you get behind the wheel, you should always double check to make sure no person, pet or stray wagon or bike is in your backup path. But something could enter your backup zone unexpectedly and you usually would not be able to see it. 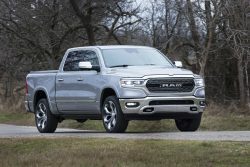 The 2019 Ram 1500 offers the 360 Surround View safety & security system which is designed to help give you those ‘eyes’ in the back of your head. Heather Scott, FCA project chief from the department of active chassis, driver assistance and passive safety, takes a closer look at how the 360 Surround View system works, and the security it offers with a bird’s-eye view of your immediate surroundings. Join us again next week when our Truck Thursday Safety and Security series puts the spotlight on Perpendicular Park Assist.